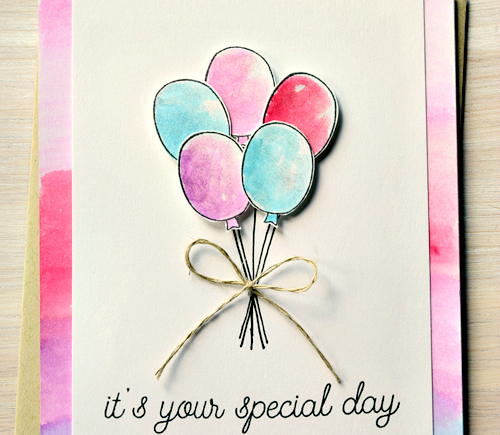 DEAR PAPERLICIOUS: Right at Home Birthday Balloons/Hey Stella! Stamped the balloons in the cute birthday set in the Right at Home May Stamped & Sealed Craft Box and added a quick wash of color. Loved making that tie-dyed looking paper under the main layer. To get that look, I watercolored the edges of a Neenah Solar White cardstock panel using the same Tombow markers that I used to color the balloons (rubbed the markers on a craft sheet and picked up the ink using very little water). The cardstock warped badly, but I glued that sucker down and then ran it through my Big Shot to flatten. There's Wink of Stella clear glitter (also in the Stamped & Sealed Craft Box) on those balloons. Every time I type Wink of "Stella" I think of this movie. Note: this is loud! Speaking of balloons, the set comes with cute wiggly ribbon line stamps but I wanted straight ones for this card. so I drew them. Oh that was so easy. Too many times to count. And those balloons are glued onto one piece of cardstock and then the whole thing is popped up. MUCH easier than trying to pop them up individually. Now why don't I ever think to make my own background paper?! Instead I make a holy mess trying to find something that will work from my stash? I don't believe I have ever seen that movie (whhhaaattt?!). But I will now always have that clip in my head when people call me "Stella"! Haha! HAPPY balloons on a perfect BG! 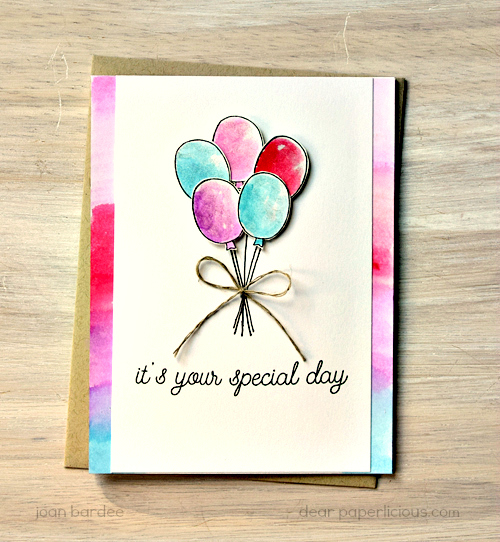 Balloons always make for a Happy Birthday - love your colorful bunch Joan B! I use THE WINK quite a lot - wonder what my neighbors will think when I start channeling Stanley Kowalski? Hey, neat idea to pop them up all together! Amazing how hard it can be to draw a straight line. Trust me, I know. Love the pretty watercolor background you created, and how it brings everything together.